Many people think that most injuries happen from falling off a horse. While this is true in many parts many injuries happen from the ground, even the calmest horse to a small pony has the capacity to really hurt somebody if they get a scare. 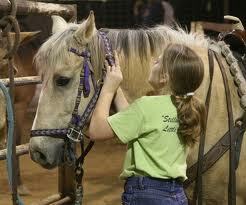 A good instructor will include as part of your learning how to handle and how to behave around horses. If you don’t know the horse then don’t walk close behind it. You don’t know if it has a habit of kicking. Walk around the horse out of kicking distance. On this, also don’t sneak up on a horse, let them know you are there and you lessen the chance of being trampled on by a startled horse. You don’t like someone sneaking up at scaring you, do you? Even if you do know the horse and it is safe remember that a horse has a wide angle of view but can’t see directly behind itself. Let the horse know where you are by keeping a hand on his body so he knows where you are. Horses are heavy, feet are fragile. Horse treading on your foot when he is blissfully unaware of it and trying to push him off of your foot hurts! Make sure you wear covered shoes around horses and be aware where your feet are. Try and keep them out of the way of hooves. The last thought on your horses mind is where your feet are and not treading on them…. If you are feeding a horse a treat offer it on a flat palm, a horse doesn’t know the difference between a slice of apple and a finger and will happily munch on both. Many horses don’t like being patted on the nose or face, so if you don’t know the horse then pat it on the shoulder or on his neck. The horse will feel safer and more at ease.